Of all the seasons, winter is probably the one which requires most care and preparation if you want to stay safe on the road. Here are our top 5 automobile systems for you to check before you hit the snow covered roads. In fact, do yourself a favor and check them before the snow season. Also, to avoid high cost of repairs and or towing as illustrated below. Note: Not doing regular maintenance could result in mechanical repairs to your vehicle. A little maintenance could save you thousands in the long run. Get winterized when it’s appropriate in your area. For us, that’s early November, but you know when your local winter arrives. Do it earlier than later – a busted radiator is way more expensive than a bottle of antifreeze. Check the levels regularly, and if you aren’t sure get the guy at the local car shop to make sure you’re good to go. In a pinch, you can also add antifreeze to screen wash so all the pipes don’t crack – but be careful, the stuff can strip paint! Better to get low temp appropriate screen wash. A local convenient store is a good place to buy some. *Only average on typical repairs and regular maintenance. 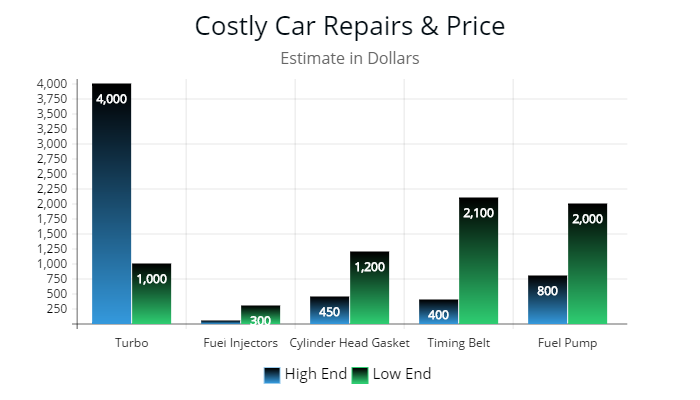 The longer a vehicle goes without regular seasonal maintenance the repair bill increases. The battery is often a cause for breakdown. They just struggle in the freezing cold. If yours is more than 5 years old, get it checked out. For older vehicles, turn off lights, etc. once you’re done using them. If there’s a vehicle you don’t use much, trickle charging helps (or be prepared to spend time on the day you do want it). *Trickle charging is charging a full battery under no-load at its self discharge rate enabling the battery to maintain its fully charged level. Get em! Always keep at least ¼ in your gas tank. Winter can easily cause highway delays and you don’t want to run out of gas at the wrong time (you need to run the engine to heat the car, right!) Awesome table here to tell you how far you can drive on empty. Consider your own supplies too. I usually have spare clothes in case of snow related accidents, blankets, appropriate snacks (stuff that won’t go off over winter and won’t freeze), a snow shovel and grit/gravel. You might need to consider some sort of fluids depending on where you are. At worst, think about what’s in your trunk and ask yourself if you could spend the night stranded with what you have. 21st Century has a great article about preparing your vehicle for winter and recommends keeping an emergency kit in your vehicle. Check and clean your lights regularly. Get all the road salt and other junk off. Remember if you have to scrape snow off the windshield, you need to check/scrape the lights too. We use the lights a lot in winter – carry spare bulbs (and know how to change them!). Keep your glass clean – glare from winter lights or low sun through the windows can stop you seeing the road. Check your wipers regularly too, especially if you’ve been running them over a little ice from time to time. Think it’s going to freeze (again) tonight? WD40 in the lock will help your key slip in easy. Not sure you know about things like stopping distances and (lack of) traction and control? Get a quick review online – courses start at about $25 and might just save your life or car. If you’re at risk of being stranded for some time, make sure you have supplies of any regular medications with you. Sunglasses aren’t just for summer. They’ll help deal with winter glare and reflections from the snow too. Lost traction on your drive wheels? Grit/gravel can help. So can dumping scraps of old carpet under the wheel to gain traction. Tony has been teaching First Aid for a couple of decades now, writes a blog about it, provides on-line safety training at Sea2Sky Services and generally tries to do whatever it takes to keep your and your family, friends, and co-workers safe.